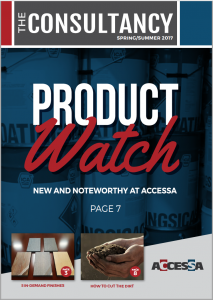 Product Watch: From a metal pretreatment cleaner/coater to coatings featuring a range of advantages, we’ve got 20 buzz-worthy products to tell you about. Dirt Smarts to Use Now: It can lead to rework, frustration and wasted money. Curb dirt issues in your facility with our real-world solutions. These Win the Popularity Contest: Here are five finishes we’re getting lots of requests for in 2017. Get the finishing process to achieve each must-have look. Nice to Meet You: At Accessa, we continue to expand our service area, industry expertise and company to better serve customers. Meet our four newest team members here.